Starbucks is a coffee retail company that sells beverages (primarily consisting of coffee related drinks) and food. 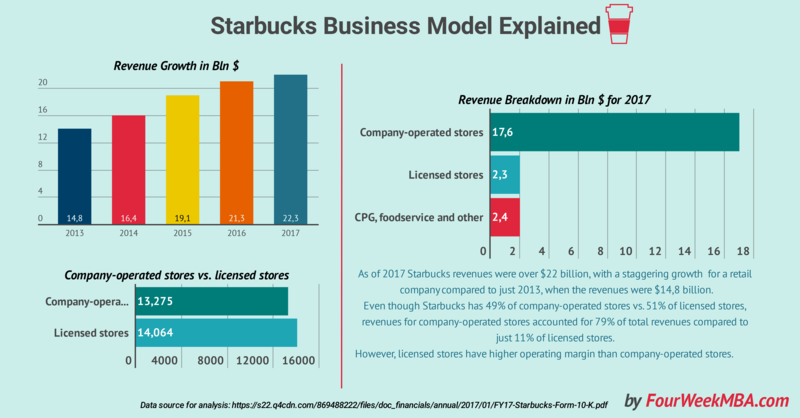 Even though Starbucks has 49% of company-operated stores vs. 51% of licensed stores, revenues for company-operated stores accounted for 79% of total revenues compared to just 11% of licensed stores in 2017. Thus even though licensed stores generally have a higher operating margin than company-operated stores, the company can be defined as a company owned business model. What are the primary segments of the business? Is Starbucks a chain or franchising? Where do most of Starbucks revenues come from? What are the most sold Starbucks products? How does Starbucks protect itself from the sudden change in the price of raw coffee? How much revenue does Starbucks make? It was the year 1983, Howard was a young man, walking through the streets of Milan and Verona. As Howard Schultz would put it, he became “enamored” by the coffee experience people had in the Italians bars. Places where the Barista knew the name of each person entering it and the coffee experience was about more than just a cup of coffee, it was about creating this sense of community. That’s how Howard Schultz set to bring that same experience back in the US. At that time, in 1983, Starbucks had three stores in Seattle. However, it wasn’t serving any beverage, but only coffee to bring home. When Howard looked at the way Italian experienced coffee, he understood the real segment of the business that could have made Starbucks truly successful was serving coffee directly to consumers. The objective was to replicate the Italian experience back in the US. Thus, making Starbucks – in the words of its founder – the third place between work and home. If we look at the mix of operated vs. licensed stores, the answer is both. However, if we look at the revenue generation, company-operated stores make up 79% of the company’s revenues in 2017. While Starbucks has over fourteen thousand licensed stores, compared to over thirteen thousand company-operated stores, most revenues come from the former. As of 2017 company-operated stores accounted for 79% of total net revenues. Instead, 11% is produced by the licensed stores, which have a lower gross margin and a higher operating margin than company-operated stores. It is important to remark that even though company-operated stores have higher gross margins. They also have a lower operating margin compared to licensed stores. In terms of revenue generation beverages represented 73% of the net sales in 2017. The total revenues in 2017 surpassed the $22 billion compared to $14 billion in 2013. 79% of net sales came from company-operated stores. If we look t the change in revenues of 2017 over 2016, company-operated stores grew by 4.8% while licensed stores grew by 2.7%. Starbucks is a coffee retail company that was inspired by a trip by Howard Schultz in Italy. When in the Bars in Milan and Verona he saw the whole experience of having coffee, he realized it was way more about building communities around local coffee shops, rather than just coffee itself. That’s how he thought to rebuild and bring the same kind of experience back to the US. Ever since Starbucks has been a global success. It also announced its first store in Milan, after decades. That represented a milestone for the company. At the financial level Starbucks has 49% of company-operated stores (in 2017) compared to 51% of licensed stores. It is important to remark that also the licensed stores are more of partnerships between Starbucks and local entrepreneurs with years of experience. Even though the model might be that of franchising, those partnerships are selected to guarantee the growth of the Starbucks brand around the world. In fact, Starbucks is among the most recognized brand names in the world.